Vodafone has announced plans to provide up to five million UK properties with "full fibre" internet connections. The telecoms firm company is partnering with broadband network specialist CityFibre to achieve the goal by 2025. Vodafone said the initiative would deliver a "superior product at a lower cost" than relying on Openreach's infrastructure, as it does at present. Openreach, which currently supplies broadband across the UK, said it welcomed the move. However, one expert said the BT division would be concerned. 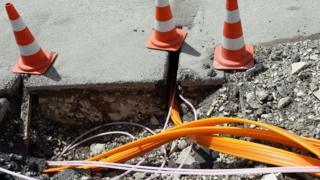 "Full fibre" broadband refers to the fact that fibre-optic cables run directly to properties, rather than relying on copper cables to connect the buildings to roadside cabinets. This provides a more robust and faster connection, but is more expensive to deploy. Vodafone says customers can expect to receive gigabit speeds - 1,000 megabits per second or higher - when it begins to roll out the service next year. Under the deal, CityFibre will own and operate the new network and Vodafone will get exclusive rights to it for an unspecified period of time. In addition, Vodafone will use the network to support radio base stations it intends to deploy ahead of the launch of a 5G mobile data service. "Vodafone has made investment in fibre build-out a massive priority in the last two to three years - particularly in Spain and Italy," commented Mark Newman, chief analyst at the ConnectivityX research firm. "The amount of data the mobile networks are carrying is going up by 50% a year - and as you build more and more mobile sites to cope with the demand in traffic... you need more fibre to carry that signal back from the base stations into the network." Openreach is already pursuing a plan to connect fibre to 10 million UK homes and businesses by the mid-2020s. It said it hoped Vodafone's plan would "complement" its own effort. "As we've said consistently - investing in more fibre-to-the-premises technology across the UK will need commitment from the whole industry," said a spokesman. But Mr Newman, said the division was likely to be privately unhappy about the development. "Openreach is a pretty good business for BT," he explained. "Any operator that chooses to install their own fibre or go to a third party is going to mean one less customer."